The toxic bufo toad (Bufo marinus) (AKA marine toad, giant toad, cane toad) is not your average toad. Its venom can be deadly to any pet that gets the toxin in its mouth and/or swallows it. It is a huge brown to grayish-brown toad with a creamy yellow belly and deeply pitted parotid glands extending down the back. Adult giant toads generally range in size from 4 to 6 inches but may be as large as 9 inches. They are non-native and are replacing the smaller nontoxic native Southern toad (Bufo terrestris) in the cities of southern Florida. The giant toad was introduced in 1936 when the Agricultural Experimental Station of the University of Florida imported 200 from Puerto Rico and released them at Canal Point and Belle Glade in Palm Beach County to control sugar cane pests. The current South Florida population of toxic toads resulted from an accidental release of about 100 specimens from the stock of a pet dealer at Miami airport in 1955 and subsequent releases by pet dealers in the 1960s. It is a relatively long-lived toad reaching ages of 10 to 15 years. 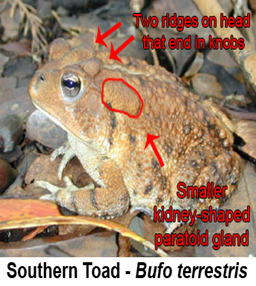 The southern toad has smaller kidney-shaped parotid glands that secrete a substance which may be irritating to mucous membranes but is not toxic. The giant toad has very large parotid glands that secrete a toxic substance. The southern toad has two highly pronounced knobs and crests (ridges) that occur on its head. The overall coloring of this toad varies from brown, black, or red. It has no dark spots and only one or two warts. 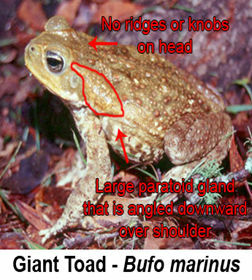 The giant toad does not have knobs or crests on its head and has dark spots and many warts. The adult southern toad ranges in length from 1.75 to 4.5 inches. The adult giant toad ranges in length from 4 to 6 inches. The toxic bufo toad sits in an upright position when it moves, and it hops in short fast hops. When confronted by a predator, it is able to “shoot” bufo toxin from the parotid and other glands on its back in the form of white viscous venom. The secretions are highly toxic to dogs, cats, and other animals and can cause skin irritation in humans. These marine toads are most frequently seen under the streetlights of the suburbs. Interestingly, opossums are immune to its venom. To avoid attracting toads, do not leave pet food outside in open dishes. Bufos are also attracted to water bowls and may sit in the rim long enough to leave sufficient toxin to make a pet ill. Another way to reduce the number of toads in your yard is to add an 18” high chicken wire fence (with small holes) to the bottom of your existing fencing. Bufo toads cannot jump higher than 15”, and adults cannot fit through the small holes. If a dog “mouths” the toxic giant toad, he/she can receive a large dose of the bufo’s toxins secreted from its skin and parotid glands. Symptoms generally include profuse foamy salivation that looks like shaving cream, difficulty breathing, brick red gums, convulsions, paralysis, ventricular fibrillation, vomiting, and uncoordinated staggering. If untreated, there is close to a 100% death rate from Bufo marinus toxicity. Keeping your dog on a leash and well supervised outdoors should be sufficient to prevent bufo toad contamination. Carry a flashlight at night to check out anything your dog may be overly curious about. These toads don’t attack, but a curious dog sniffing or licking the toad can be poisoned. South Florida pet emergency clinics see about six cases monthly and many more during the rainy season. Bufo toads (the term is redundant as bufo is Latin for toad) are seen mostly during the rainy season (late May to mid October) and most often at night near well lit areas because bugs are attracted to light and toads are attracted to bugs, their primary food source. They are infrequently during daylight hours but can be found hiding under vegetation. IF YOUR PET SHOWS BUFO TOAD TOXICITY SYMPTOMS immediately rinse out the pet’s mouth with a dripping wet wash cloth several times to remove any toxin from the mouth, pointing the pet’s head downward to avoid the toxin being swallowed. Do not use a hose to rinse the mouth as water can easily be forced into the lungs causing more problems. Proceed to the nearest veterinary clinic or emergency clinic because time is of the essence. The smaller the pet or the larger the toad, the greater risk of toxicity. The death rate for untreated animals affected by Bufo marinus toxin may approach 100%. HUMANELY ELIMINATE any giant toad you find by rubbing or spraying 20% benzocaine toothache gel or sunburn spray (not 5% lidocaine) on the toad’s lower belly; in a few minutes, it will become unconscious. Then put the toad in a sealed plastic bag in the freezer for 24 to 48 hours to ensure that it is humanely euthanized before disposal. These toads are a non-native species and are not protected. WEC-11, one of a series of the Wildlife Ecology and Conservation department, Florida Cooperative Extension Service, Institute of Food and Agricultural Sciences, University of Florida. Published: June 1990. Reviewed: September 2002. The mission of BallenIsles Wildlife Foundation is to preserve, foster, and respect all animal life in the BallenIsles community. A 501 (c) (3) nonprofit organization funded by donations and led by dedicated volunteer residents.